Over the last five months, my women's group has been reading A Praying Life: Connecting with God in a Distracting World by Paul Miller. This study came at the right time in my life, when I felt God challenging me to move deeper in prayer. It provided a new approach to prayer, and encouraged me (along with my prayer partner and our study group) to move forward with all God was teaching me. This book approaches prayer as a means to seeing and understanding God's bigger story in our lives. He weaves the lessons in the book through the journey of his life with his family. There were some legitimate complaints about some of the editing choices and writing style, but overall I enjoyed this book. 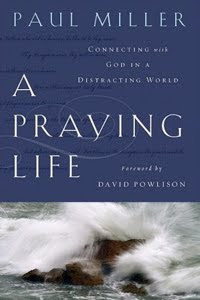 The book opens with several chapters set to redefine the way we view prayer and our relationship with God. These chapters are healthy reminders for mature Christians and extremely important lessons for new disciples who are still learning to see the world through God's eyes. It does not take long before the book delves into the deeper struggles and hidden darkness in the lives of most Christians to varying degrees -- lack of faith, wrong priorities, pride, cynicism, lack of surrender, desperate clinging to control. Although some of this was very basic, I found myself challenged by some of the attitudes that it revealed in me that God wants to replace with HIS perspective and HIS truth. After confronting the struggles and issues we often have with prayer, the author turns to focus on the story that God is writing in our lives, showing us, encouraging us to be aware of the bigger picture that God is working all around us. I was extremely encouraged by this new perspective, to lift up my eyes (and my prayers) from just seeing the day to day and instead see the beautiful tapestry that God is weaving in my life and the lives of my family. The book concludes with concrete ways to apply our new lessons in prayer. He talks about the weakness of any prayer system, warning that we not allow prayer to become a ritual instead of communion with God. This author uses both prayer cards and a prayer journal, but not in the structured, overwhelming way I have seen before. His prayer cards focus on scripture and praying big-picture issues in the lives of those we love. For example, he spent years praying for his daughter, that she not love the things of this world, praying 1 John 2:15-16 in her life. "How am I doing? What is coming at me? Am I happy, sad, thankful, discouraged, angry, frustrated?" "What is God saying to me? What does the Word say?" As we learn to live in obedience and repentance, fully surrendered, we learn to see the story God is creating in our lives and enter into the communion God wants to have with us. i love how teachable you are Christy- that is a great strength of yours! Enjoyed doing the study with you, this is a great summary of the book!